Arts Downtown Park Rapids on Thursday July 21 from 5-7 p.m. The North Star Ensemble (from left) Kathy Gorentz, Donna Neumann, Anita Hannemann and Walt Hannemann will play from 5:30 to 6 and 6:30 to 7 p.m. at Bella Caffè, one of five sites on the Arts Downtown PR schedule Thursday, July 21. David Overly will read the poem, “The Creation” by James Walden Johnson, and some Robert Frost poetry from 5 to 5:30 and 6 to 6:30 p.m. at Beagle Books, 112 3rd Street West. Enjoy Taylor Schroeder playing and singing folk and folk rock from 5 to 5:30 and 6 to 6:30 p.m. at The Good Life Cafe, 220 Main Ave. South. 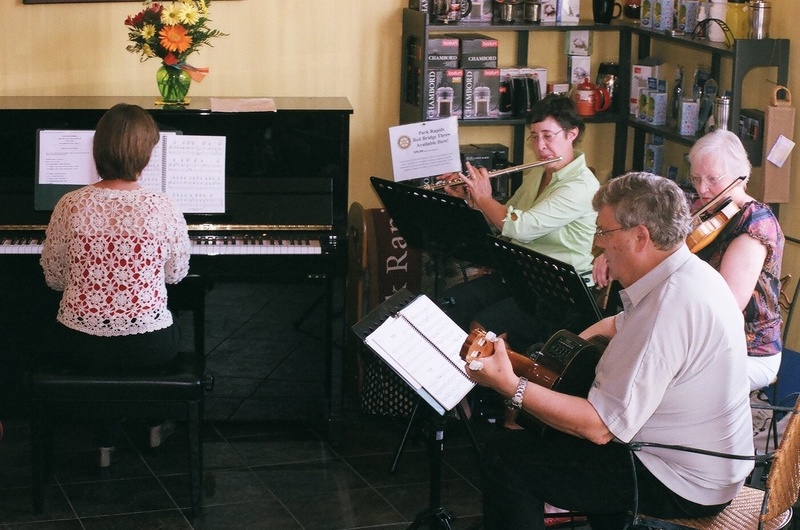 At Bella Caffè, the North Star Ensemble (Walt and Anita Hannemann, Donna Neumann and Kathy Gorentz) will perform from 5:30 to 6 and 6:30 to 7 p.m. Bella Caffè is located at 116 3rd Street West. The Silk Strings (Brian Keske and granddaughter Megan) will play at Blank Canvas Gallery & Education Center, 311 Main Ave. South, from 5:30 to 6 and 6:30 to 7 p.m.
A bonus this month will be the Kids Theater Camp performing “Under the Surface” at 5:30 p.m. at the Park Rapids Area High School auditorium, 401 Huntsinger Ave. Twenty-four students wrote the play and will direct the production and act. Arts Downtown Park Rapids is designed to bring audiences to see and hear visual artists, musicians, writers and other artists in businesses in downtown Park Rapids on the Third Thursday of the month year round. The public is invited to attend and encouraged to make a free will donation to the artists. Contact Lu Ann Hurd-Lof at 652-4081, luann47@gmail.com. Other Upcoming Events: FREE Grant Writing Workshops in Baudette and Mahnomen, call 218-751-5447 or email staff@r2arts.org to register.